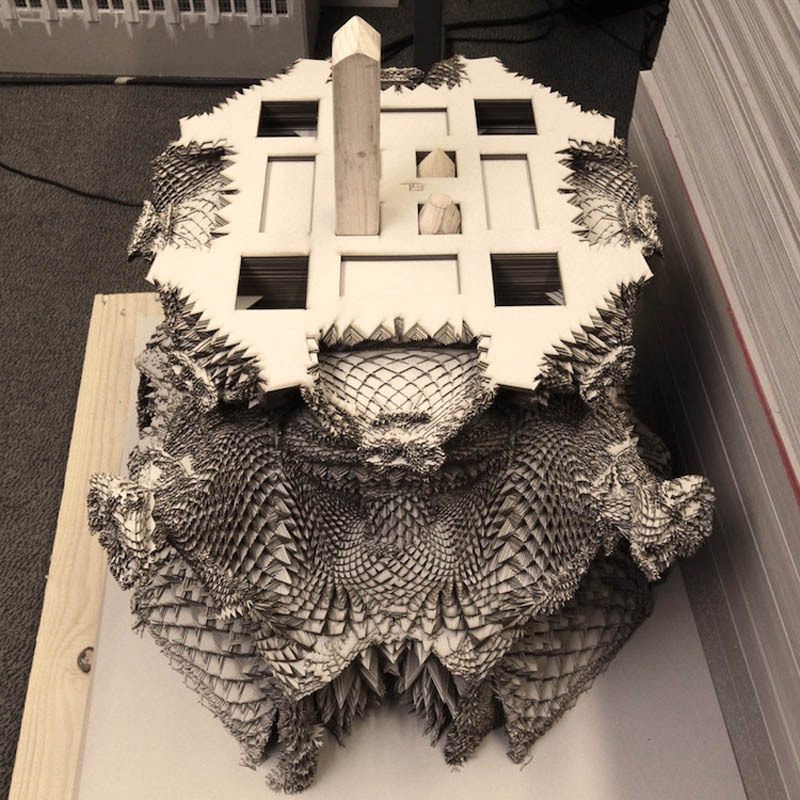 Architect and programmer Michael Hansmeyer has undertaken a most ambitious project, designing an incredibly ornate and complex column with over 16 million individual facets! Hansmeyer has taken his initiative beyond the computer design phase and actually fabricated a full-scale 2.7 meter (8.8 ft) column made from stacked cardboard sheets. Check out the pics and information below for more details on this fascinating exploration. The project involves the conception and design of a new column order based on subdivision processes. 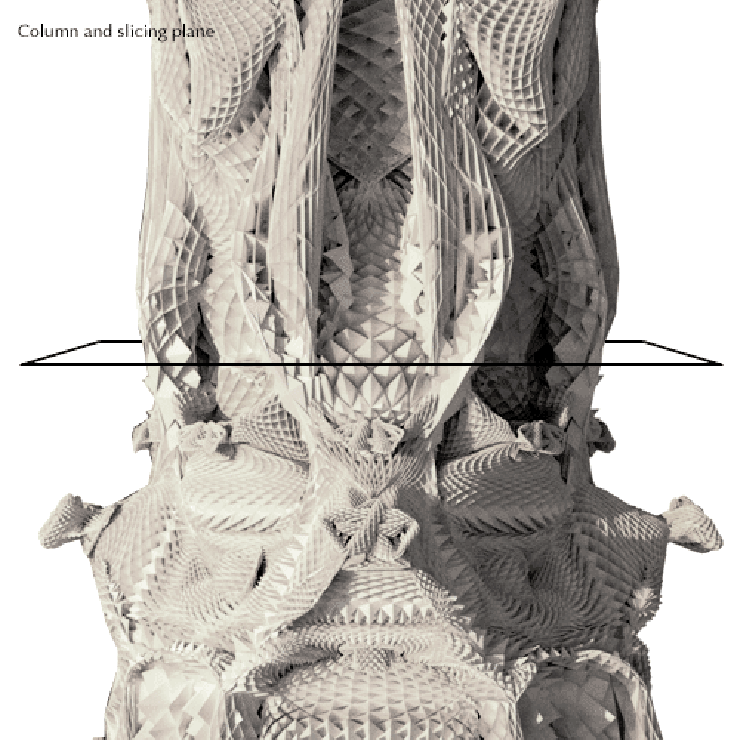 It explores how subdivision can define and embellish this column order with an elaborate system of ornament. An abstracted doric column is used as an input form to the subdivision processes. The abstracted column conveys a significant topographical and topological information about the form to be generated. The input form contains data about the proportions of the the column’s shaft, capital, and supplemental base. It also contains information about its fluting and entasis. The input form is tagged to allow the subdivision process to distinguish between individual components. This allows a heterogeneous application of the process, with distinct local parameters settings. In addition to distinguishing among tagged components, the process parameters can be set to vary according to the input form’s topography as well as its topology. Finally, an environmental specification of parameters is possible to allow regional phenomena to occur. The result is a series of columns that exhibit both highly specific local conditions as well as an overall coherency and continuity. The ornament is in a continuous flow, yet it consists of very distinct local formations. The complexity of column contrasts with the simplicity of its generative process. 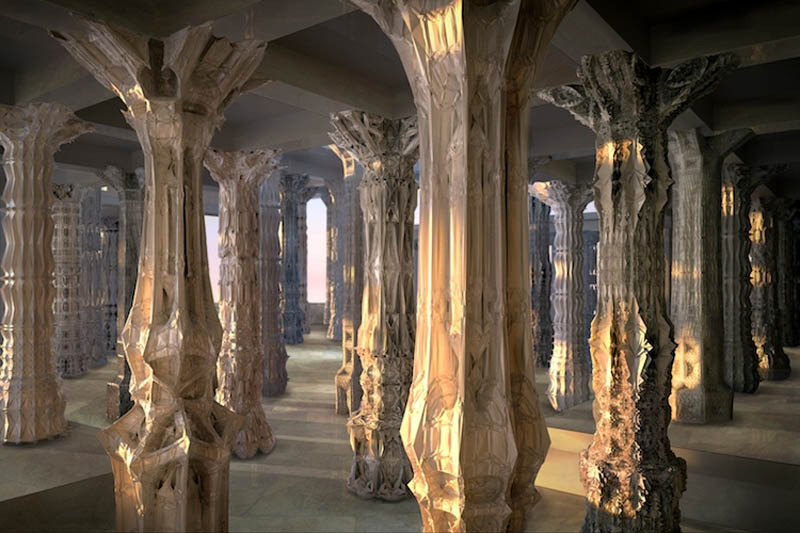 A full-scale, 2.7-meter high variant of the columns is fabricated as a layered model using 1mm sheet. Each sheet is individually cut using a mill or laser. Sheets are stacked and held together by poles that run through a common core. The calculation of the cutting path for each sheet takes place in several steps. First, the six million faces of the 3D model are intersected with a plane representing the sheet. This step generates a series of individual line segments that are tested for self-intersection and subsequently combined to form polygons. Next, a polygon-in-polygon test deletes interior polygons. A series of filters then ensures that convex polygons with peninsulas maintain a mininimum isthmus width. In a final step, an interior offset is calculated with the aim of hollowing out the slice to reduce weight. While the mean diameter of the column is 50cm, the circumference as measured by the cutting path can reach up to 8 meters due to jaggedness and frequent reversals of curvature. The initial prototype uses 1mm grey board. Tests using ABS, wood, as well as metal are under way. Fabrication of the column prototype was carried out at ETH’s CAAD group using the university’s RapLab. Fabrication assistance was provided by Manuela Koller, Thomas Raoseta, and Edyta Augustinowicz. 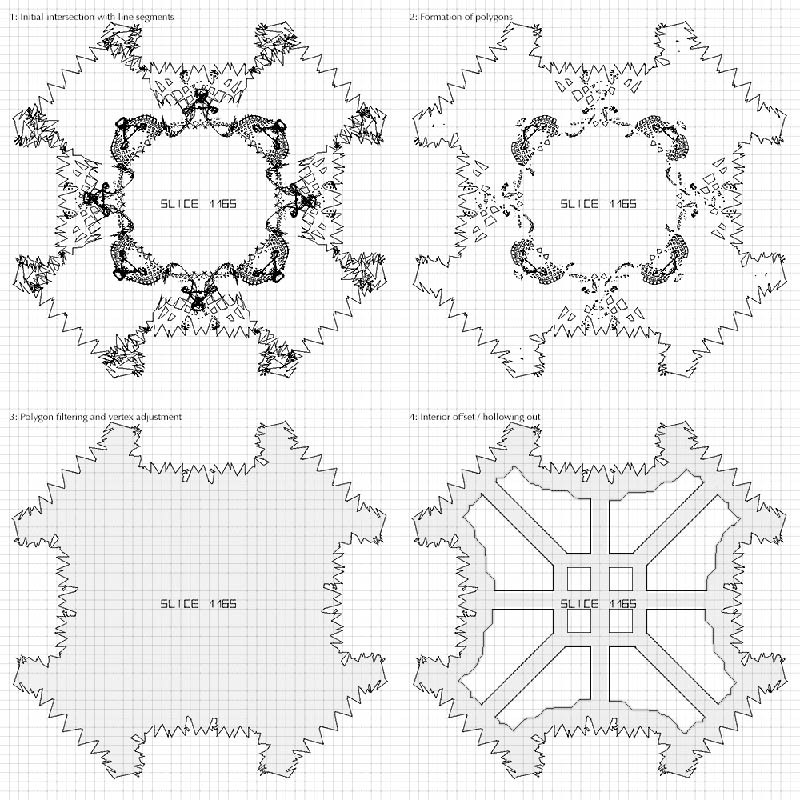 Michael Hansmeyer is an architect and programmer who explores the use of algorithms and computation to generate architectural form. He is currently based in the CAAD group at ETH’s architecture department in Zurich. He holds an MBA degree from Insead Fontainebleau as well as a Master of Architecture degree from Columbia University. He previously worked with McKinsey & Company, J.P. Morgan, and at Herzog & de Meuron architects.